Whether you’re already a Breyer horse fan or you want to start a collection for the child in your life, Jack’s Country Store has the Breyer horse accessories and play sets you’re seeking. Let their imaginations go wild as they invent worlds of fun with these gorgeous Breyer horses and several realistic Breyer horse barns and more. You’ll love watching your children create new worlds and scenarios with their new best friends. 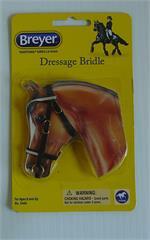 The Breyer horse accessories you’ll find here are made to fit the traditional Breyer horse models. 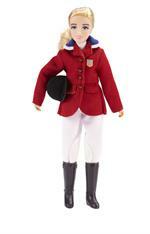 And you’ll find everything from the Ashley and Austin rider dolls to tack boxes, bridles, and corrals. If you’re new to this line of premium toys, you’ll be amazed at the attention to detail on each piece. Check out the stable cleaning accessories—they are picture perfect. 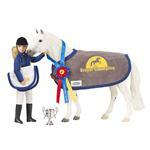 You may find yourself wrapped up in the world of Breyer horses right along with the kids. For the younger set, you may want to check out the plush Breyer horses for sale. The cuddly little equines are great both for collecting as well as a bedtime pal. The older crew may also like the paintable Breyer horses or the “learn to draw” items—they are worth a look as well. Be sure to bookmark us and return to keep adding to this beautiful collection that can be enjoyed for years and even passed along to the next generation of imaginative youngsters. Updated version for 2015, Breyer Horses Jake the Farrier Horseshoer doll comes complete with blacksmith tools and accessories. Hang onto that trusty steed with this sturdy and durable halter with matching lead. Clean her with warm water, and watch her mane, tail and celestial markings change color! When she dries, colors return to normal. Includes: Luna unicorn, bathrobe, atomizer spray bottle, and brush. Luna is perfect for kids over 2 years old. Breyer Model Horses Traditional Size Taylor Cowgirl Rider is a fully articulated 8" rider doll for plastic model horses. A charming pink and white jump with 2 standards, 3 brush boxes and 2 adjustable poles. These blankets feature fun patterns like flowers, stripes, and dots, and trimmed with a sparkly trim. Black bridle accented by white on noseband and browband. Horse not included. Fully adjustable Snaffle Bit style bridle for Traditional Size Models. No matter if you prefer Dressage to English Pleasure or if Cross Country is your thing you will feel like a champion with this set. Designed for Traditional Size Breyer model horses, the Going to the Horse Show accessories set includes everything you need to get your model horse ready for the horse show. Authentic, finely detailed grooming kit includes hardwood grooming box, sweat scraper, curry comb, hoof pick, face brush, body brush, hoof polish, electric clippers, and mud scraper. Bright colors are all the rage in today's horse world, and Breyer has them! This 3 piece assortment of Hot Pink, Hot Blue, and Hot Purple halters will tack your Breyer horse in style. Rambo HorseWare Ireland is renowned worldwide for quality and innovation. Their Rambo turnout blanket sets the standard against which others are measured. Dark green blanket with red edging, chest buckles, and belly straps. Breyer Model Horses' Show Jumping Brenda is a 8" articulate rider doll scaled to fit Traditional Size Breyer model horses.